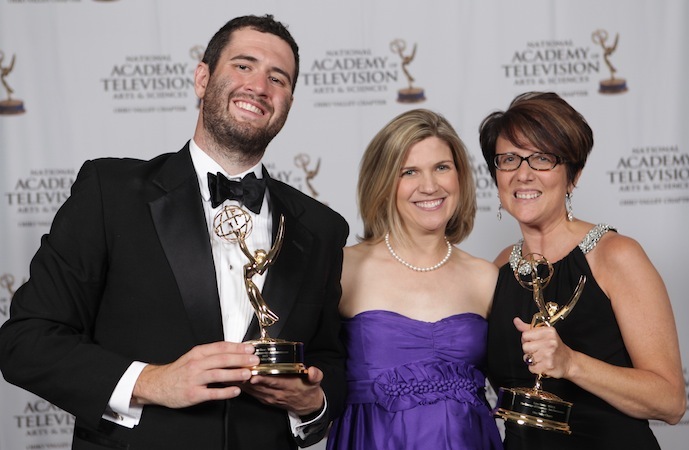 UNC Charlotte researcher Margaret M. Quinlan and colleagues won a regional EMMY® on August 2, 2014 for The Courage of Creativity, a documentary series that explores the role that artists and creativity can play in people’s well-being in health-related contexts. The series earned its award from the Ohio Valley Regional Chapter of the National Academy of Television Arts and Sciences in the arts/entertainment category, at the 50th EMMY black tie gala at the Hilton Columbus Downtown. Quinlan, an associate professor in the Department of Communication Studies in the College of Liberal Arts & Sciences, is associate producer for the production. She is working with lead producers Lynn Harter, professor, Scripps College of Communication, Ohio University; Evan Shaw, chief videographer/editor, WOUB; and Thomas Hodson, WOUB director and general manager, who is an associate producer on the series. Each segment of the production is at different stages of development. The series features three organizations – DooR to DooR: Healing Arts Program in Chapel Hill, the Arts in Medicine Program at MD Anderson Cancer Center, and the Collaborative Art International. Each organization provides opportunities for participants to express themselves, connect with others, and develop resiliency in the midst of hardship. The documentary draws from years of research and work, Quinlan said during an interview with WOUB that was televised after the event. “We’ve seen this in action, so it’s just nice to be able to share it with others and to be able to share these really intimate moments with people, (as moments) that we know make a difference in their lives,” Quinlan said. To learn more about supporting The Courage of Creativity, contact Margaret Quinlan, associate producer, at 704-687-0776 or mquinla1@uncc.edu.